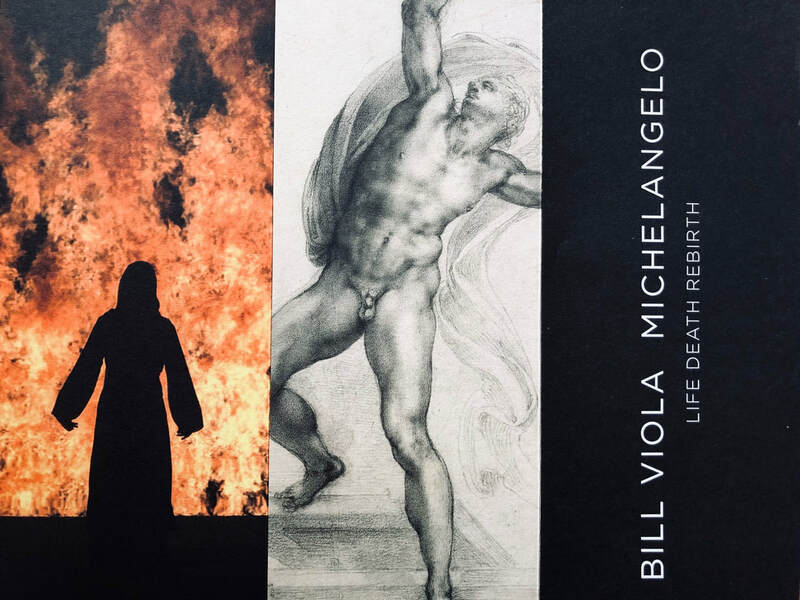 Definitely not a show for the feint hearted, London's Royal Academy of Arts pitched together "the divine one" Michelangelo Buonarotti (1475 -1564) and American video viruoso, Bill Viola (1951 - present). The theme, as per the title, explored the each artist's visualisation of their own inner research into Life, Death and Rebirth, and the significance of these within the contexts of religion and spiritual essence. On entering the exhibition, the visitor first needs to adjust to the total pitch darkness that envelops them on passing the heavy black curtain across the portal to the other side. Sounds are the first stimulus which register with the senses, and one is then drawn along a blackened corridor, and deeper into the experience. THe sound is of water, but muffled as if you were already immersed in it. Then ... a blue light guides you into the first womb like space. Bill Viola, began to experiment with video in the 1970, growing from single-monitor works, to large scale and immersive installations, propelling the medium from the margins of contemporary practice, into the mainstream. Always exploring the technical limits of his chose tool, he also understood that from a philosophical stand-point, the medium can be invested with a mystical and spiritual significance. His work has always been informed by an interest in medieval and Renaissance art, as well as Buddhism, Sufism, and Christian Mysticism, combining contemporary technology with continuing traditions of spiritual and affective art. In the first encounter, The Messenger (1996), originally exhibited in Durham Cathedral. In a looped video, a naked man submerged deep underwater, very slowly rises to the surface, where he breaks surface and takes in a gigantic lungful of air, before returning to the depths. Implied here is the universal truth of life and death from which there is no escape or alternative endgame. Following on from this exhibit, is the even more disturbing Nantes Triptych, (1992) in which three screens one next to the other, show on one side a woman giving birth, on the other side a close up of Viola's mother a week before she died, and in the middle a figure floating in water, sometimes calmly, at other moments in spasms of turmoil. Life, death and all that happens in between, captured in one extraordinary video installation. 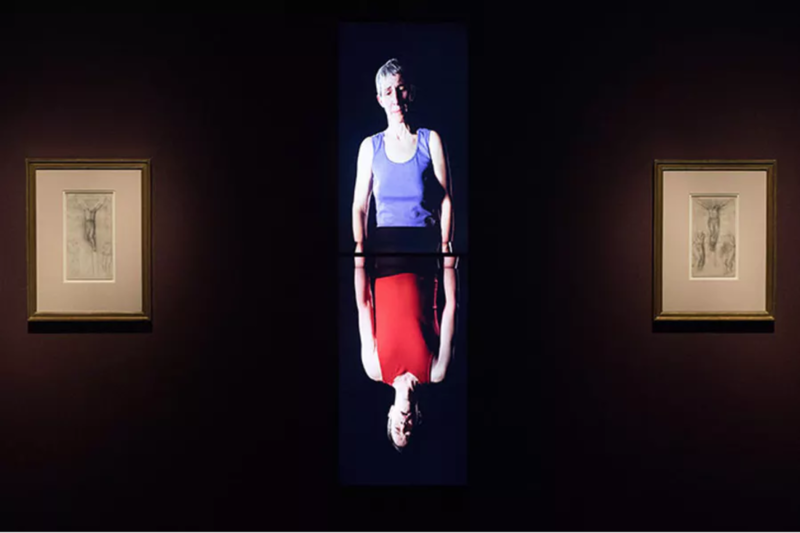 Bill Viola it seems has discovered that video not only has 2 dimensions, but also 3D and even a forth dimension, which is a temporal dimension, as revolutionary to image-making as three-dimensional pictorial space was in the Renaissance . 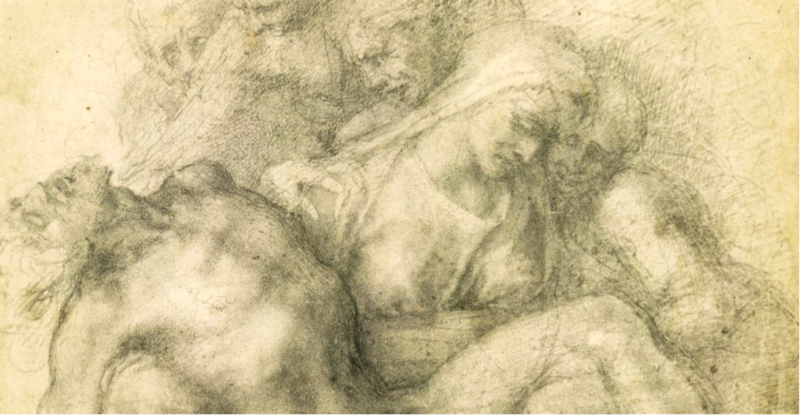 A detail from Figures Study for the Lamentation Over the Dead Christ (1530), by Michelangelo Buonarotti, was one of a host of extraordinary works loaned by HM Queen Elizabeth's collection, and supported the avant-guard video work of Viola, by providing both a classical backdrop, and a parallel philosophical consideration of the central paradox to all of our lives, that death and life co-exist. Michelangelo was deeply christian, but also influenced by the Neoplatonist position, that a divine presence actually exists within all things. At the heart of his art, is the belief that the contemplation of beauty is capable of elevating the souls to a higher plane. His skill as an artist, one of the greatest artists ever in fact, is well attested by the works displayed, which include many drawing made in the final years of his life, and mostly likely as personal meditations on his own impending death. Figures where strong and bold lines become increasingly smudged and imprecise, give notice of the slow fade out which is the eventual fate of us all. 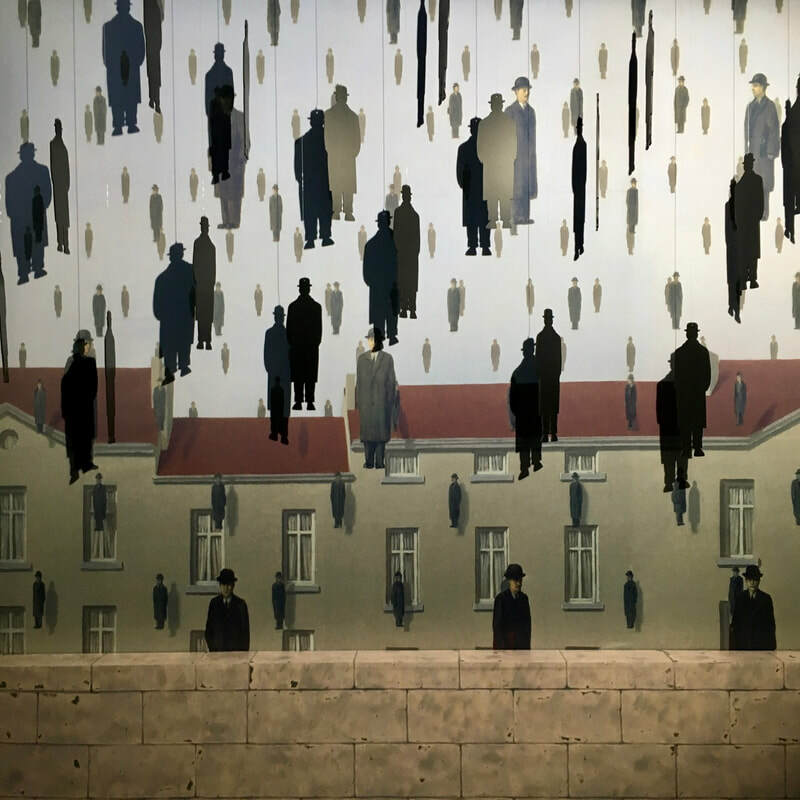 As if to underline the fact that we are all living in a state of suspended animation, one of the final exhibits is a room containing vertical screens on each of it's four wall, everyone of which contained a single person, suspended in water. All of different ages and ethnicities, it gave an overwhelming sense of life being little more than a waiting game, book-ended by it's two main events: LIFE & DEATH. As far as REBIRTH is concerned, it really depends on which book of truth you subscribe to. 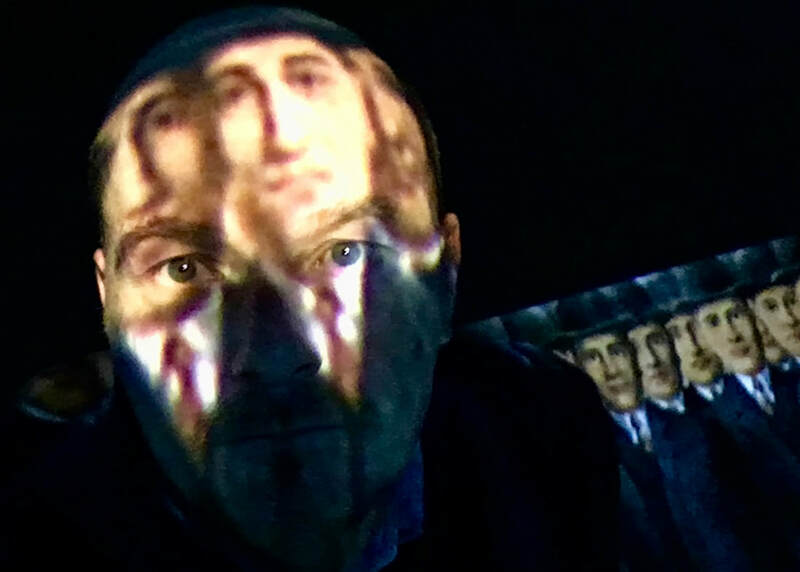 Once again, it's easy to confirm that immersive experiential happenings are immesely rewarding, provided they are not too crowded by tourists; especially those who cannot moderate the volumes of the voices, or their children. The pairing of these two artists is curious and extremely Retromodernist in it's intention. In parts it works as a fantastic and well balanced juxtapostion, but in other parts, the profound statements made by Michelangelo inevitably steal the show, as is the case of the crucifixion studies made in Michelangelo's later life, when he is using hard and soft edges within his composition, where the boundaries between Christ and the cross disappear, have a depth and level of personal quest for truth, which are hard to match. That said, exhibition has provided those who were lucky enough to witness it first hand, exactly the type of stimulation art is supposed to provide. Well done again RA ! 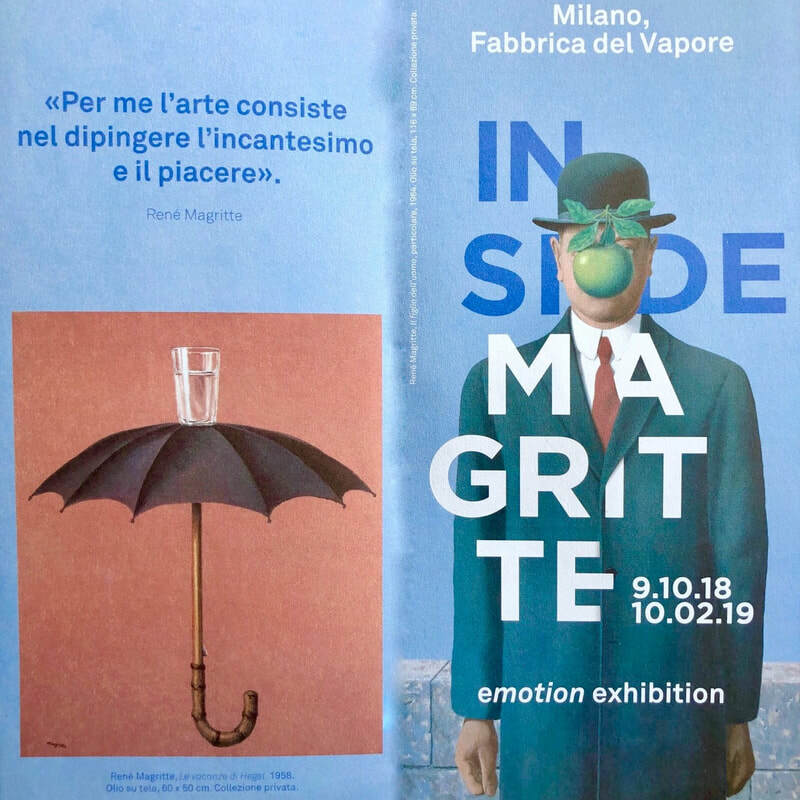 There is absolutely no doubt in my mind, that the "Inside Magritte" Exhibition hosted by Milan's Fabbrica del Vapore, is in line with a trend which has echoes in retail, restaurants and many other sectors. In this age of emotional fusion between soul searching and the self promotion via Instagram in particular, the way to the consumer's heart is to provide a unique experience which can not only be experienced, but can be relayed as an extension of our own being. 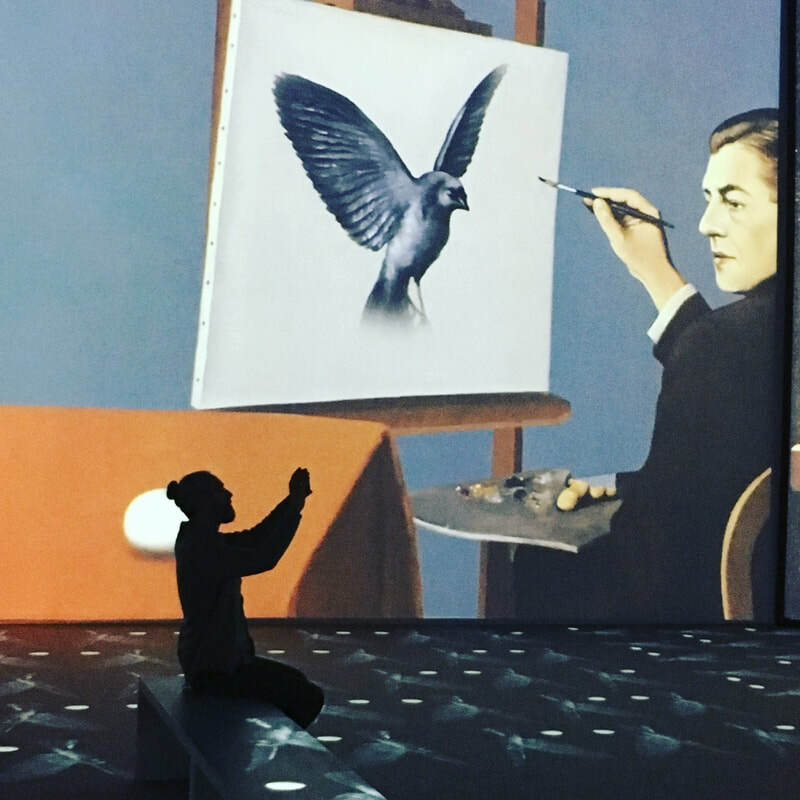 The quote above translated means "For me art consists of painting enchantment and pleasure" and the organisers of this exhibition, managed to capture the essence of both, with an experiential tour through the life, the influences and the work, of one of the greatest innovators in modern art, René Magritte. If seeing a painting up-close remains an irreplaceable experience, Magritte actually considered the painted image to be of more importance than either the technique used, or the manner embodied in that painting. He also stated that seeing a copy of a painting on a postcard was enough to truly appreciate it, and that visiting museums bored him! For this exhibition, the Curators have taken licence to recreate an experience which entertains, informs and immerses you in the world of the artist. 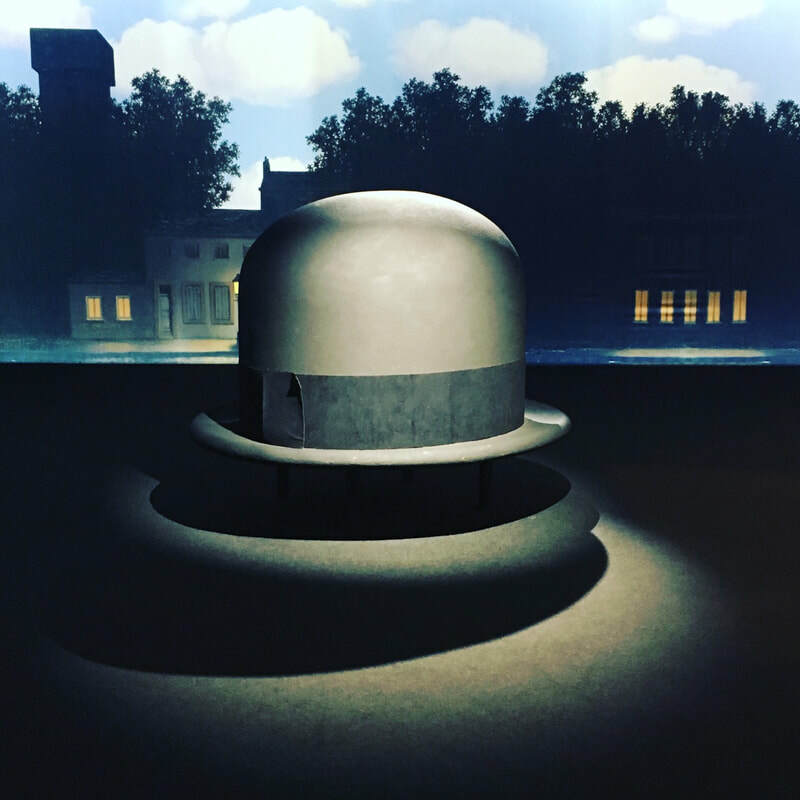 You are greeted by a trademark giant bowler hat, set in the darkened context of a presumably Belgian landscape. You move through a part of the exhibition which unveils the historic period in which the artist was working, his influence and place in the the History of Art. Retromodernism certainly comes to mind, with Magritte's experimentation and inclusion of different elements from different schools such as Classical sculpture, Cubism, Mannerism and the figurative style of the Neoclassicists. The visitor finally arrives in a vast chamber in which 36 Canon projectors filled every inch of the space with a kaleidoscope of superbly orchestrated images, accompanied by an equally well selected sound-track. I saw young and old together, soaking up the fabulous art as multi-sensory event, rather than a tedious trudge down the corridors of a museum. This is an approach, that is without doubt at the heart of a revolution taking place in retail at the moment. 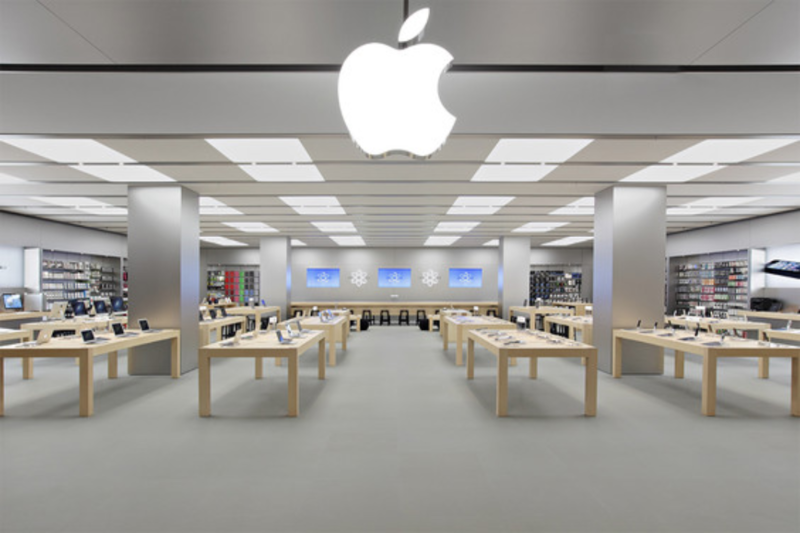 The now former Senior Vice President of Apple, Angela Ahrendts began a mission during her tenure as CEO of Burberry, to transform the face of retail, making it a relevant experience for the generation of digital native which formed the brand's customer base. The commitment among other things to courses, workshops, the Genius Bar, and having super smart, friendly young store staff, engaged people directly on a very personal and emotional level, giving those digital natives something they actually longed for: human contact. This was in fact a continuation of the philosophy promoted by Steve Jobs to his staff: "Your job is not to sell to people, you job is to enrich their lives through the lens of education." 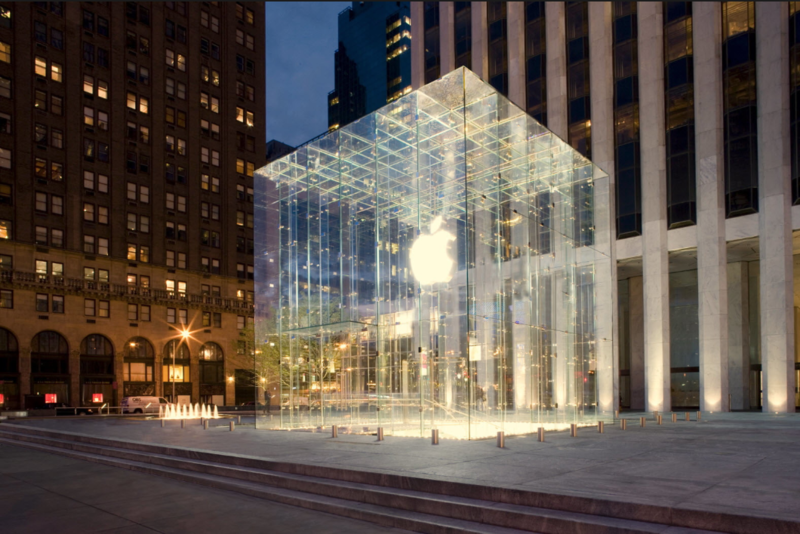 Though great product, an engaging experience and brilliant architecture, Apple have embedded themselves in hearts of their millions of fans and users. The strategy of Jobs has paid off, and has it's followers in other sectors. 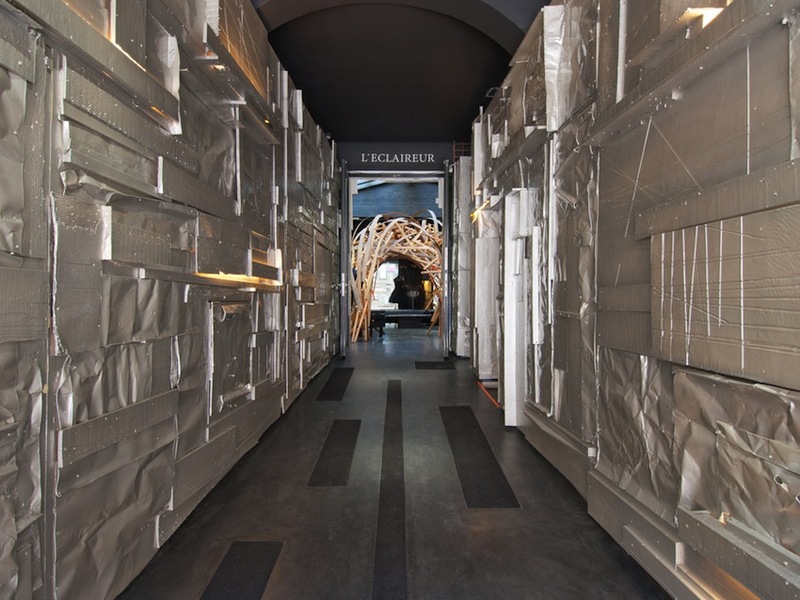 Ahrendts shows great admiration for what CitizenM and Soho House have created: "They have filled this huge niche, a combination of experience and human connection". 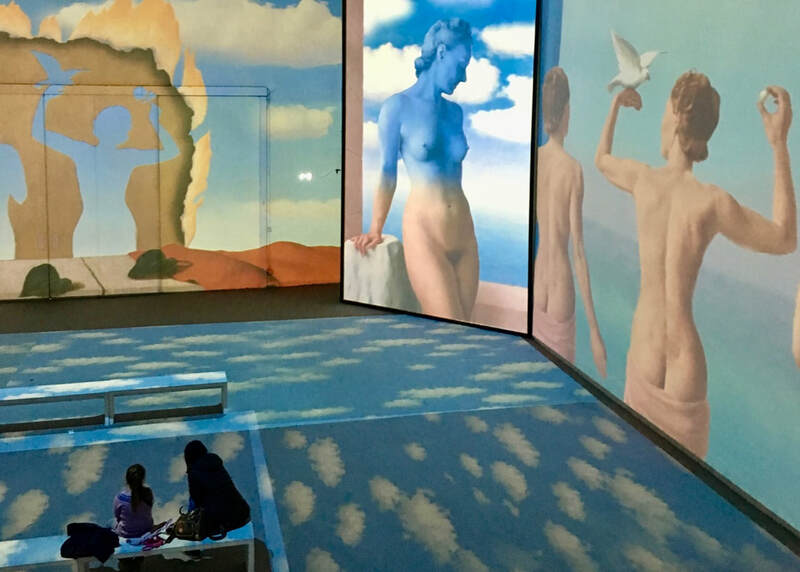 In their own way, the organisers of the Magritte show, have repeated that very neat trick, creating an experience which inspires and educates at the same time, literally soaking the visitor in the spirit of the artists. 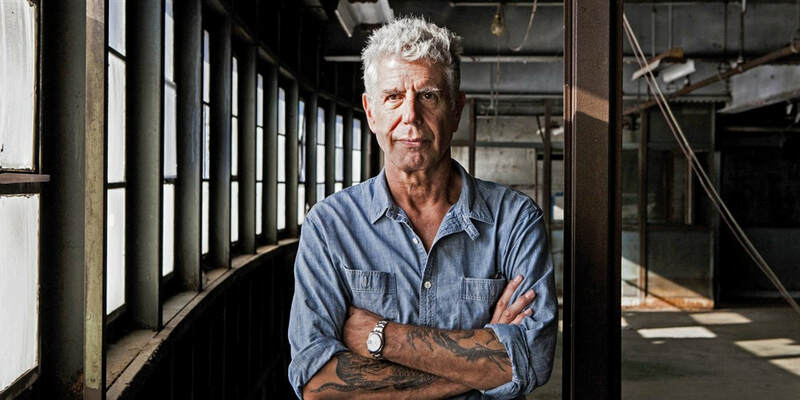 I'm genuinely shocked and saddened, as I believe are many others around the world, that Anthony Bourdain, at the height of his fame and success, chose to take is own life in a Strasbourg Hotel, whilst filming for a new series of his hit show, "Parts Unknown". In the wake of other notable suicides in recent times, designer Kate Spade, and musicians Avicii and Chris Cornell, American networks are predictable abuzz with opinion-makers and influencers thrusting themselves into the limelight, calling for closer attention to the warning signs, and other options open to those who might potentially succumb to the depths of depression. 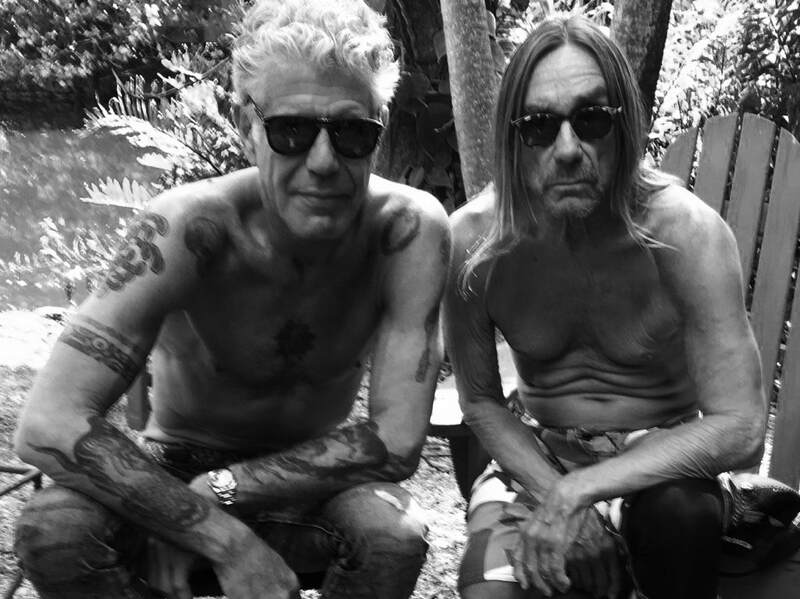 All that said, Anthony Bourdain's tragic death is a shocker. I have always since childhood, had a fascination with TV chefs, and indeed in the UK, we have has so many notable faces, from Fanny Craddock & Johnny, through the Galloping Gourmet & Ken Homm, the blissfully boozy Keith Floyd, to contemporary chefs including Hester Blumenthal & the insufferable Gordon Ramsey, and novelty presenters like Andrew Zimmern. As a family, we've sat through countless episodes of Master Chef, and Jamie Oliver feels almost like an extension of the family. But not withstanding of this exposure, Bourdain for me went far beyond the foodie thing. His stance has always been distinctly rock & roll; a no reservations, no holds barred dive into the experience of life, with which I felt a powerful affinity. Travel, food, drinking & experiencing, are all part of the pleasure of being on this earth, and a pay-off for the many more painful aspects. When someone takes their own life, those more painful aspects have clearly overhauled everything which makes it all worth while. Everyone I think, has faced these moments when you weigh it all up. I have, and the answer was yes; we'll give it another spin of the glass... you never know. 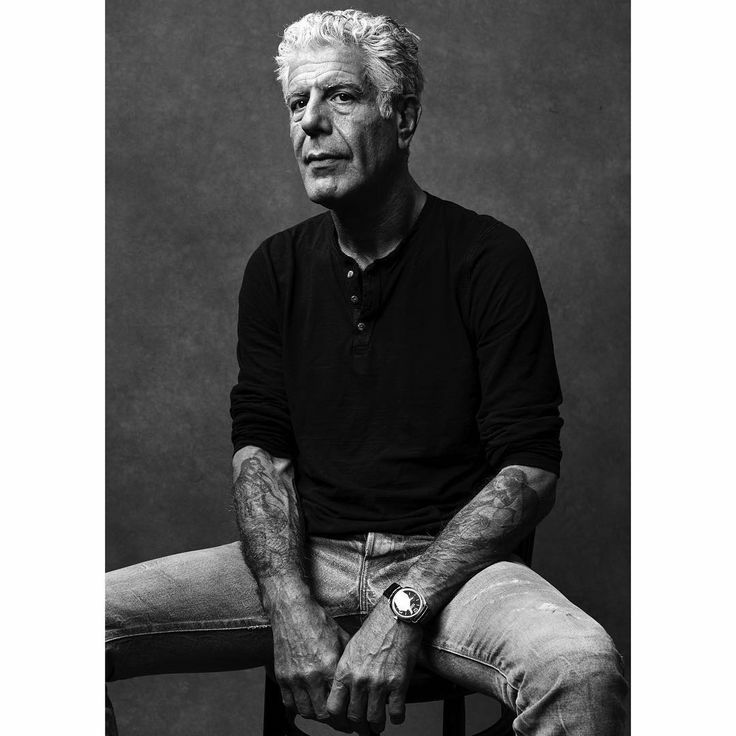 This was what I was certain, would have been AB's standpoint, especially have fought through drug-abuse and a life of pretty hard toil, without seeing great results until "Kitchen Confidential" changed his life overnight, at the age of 44. So were these elements personal or a comment on a society which he had seen right up close, and possibly so offended what I believe to be a super sensitive side to the guy, that he saw no sense in what he was doing or where he was going. I can only hope that he's found peace wherever it is that we go when we do throw in our hand and check out of this complicated and cruel life. Take care Tony. I find myself once again writing about cinema, but once again, I find find that this medium throws up, ever so once in a while, an offering which really alters my perspective on communication in general. Rarely does this happen in fashion, and rarely does it it happen in photography, unless we are consider reportage and the World Press Photographers currently being exhibited at the Corso Como 10 Gallery in Milano. 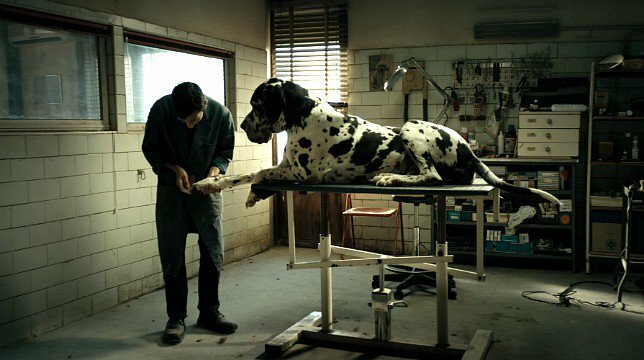 From the very first in-your-face frames of a terrifying baying dog, counter-pointed by the calming voice, and then the figure of the film's dog-groomer hero, Marcello, Matteo Garrone draws us into a violent and disturbing world. From the opening sequence, I couldn't take my eyes from the screen. 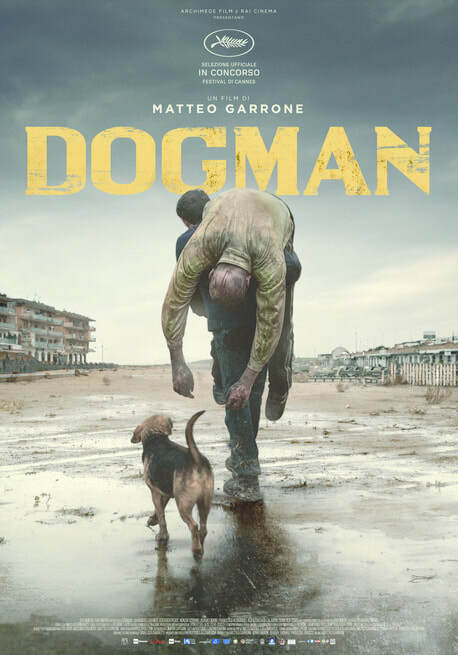 Such is the performance of the cast, brilliantly assembled by Francesco Vedovati, and in particular relative unknown Marcello Fonte, and such is the beauty of the photography in this harsh setting, that "Dogman" truly stands out os a reference for all wannabe film-makers in my opinion. Based loosely on the true story of the "Il Canaro della Magliana" the film sets the scene for the murder which forms the movie's climax. Everything up to then is meticulous, and exquisitely constructed character and social study, highlighting the ease with which people justify their own existence, that of others, and intervene... or not, when situations become untenable. The performance by Marcello Fonte is utterly spellbinding, and worthy of every leaf on the Palm D'Or he so deservedly won at this years Cannes Festival. The only downside of having seen this example of cinema at it's very best, is that it really makes it tough to watch movies of lesser craft and value subsequently. A rare and wonderful occasion to restore faith in Italian Cinema, or at least a small part of it. That said, the film is as one might expect, very far from being commercial; I watched it at my local Cinema Moderno, along with a disturbingly grand total of 8 other "bums on seats". Hopefully the Cannes success will drive footfall to theatres... we live in hope! 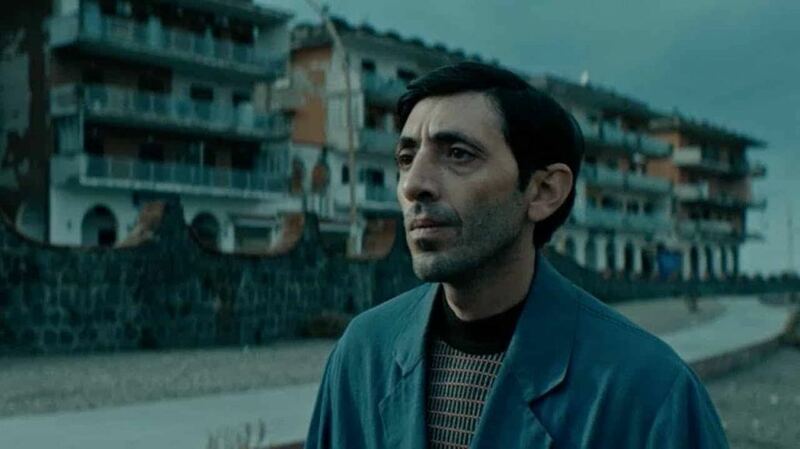 In a year in which Italian Box Office has suffered a 4 year low-point, decrying the absence of a vehicle from Ceccho Zalone, a national popular comedian who actually manages to pull of some pretty poignant social satire, it is no surprise that the intricate psychological drama offered by the masterful Ferzan Ozpetek, would be marketed on the strength of a 10 minute opening sequence, featuring a raw and passionate sexual encounter. Anybody heading to the the theatre hoping for a bunga bonanza, will be sorely disappointed. Marketers and journalists alike, are doing the movie, the director, the cast, producers, and audience, a huge disservice. Take note corriera della sera and others. Ferzan Ozpetek is one of the smartest directors working today, and "Napoli Velata", is a treat for those with the patience and curosity to climb aboard, and simply enjoy the ride. 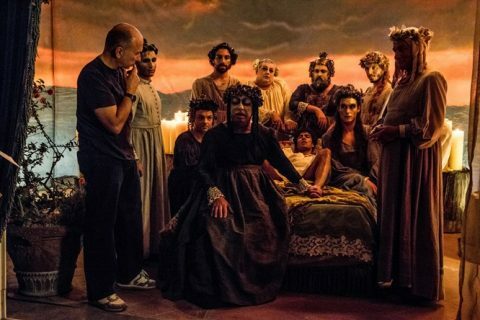 One of the cast commented that Ozpetek lived the experience of Napoli as a city, as "offering questions but very few answers". Such is life, and such is this film. A thriller, a fantasy and a slice of life, which takes place in a mysterious but powerfully charged city, lush sets and back-drops, populated by larger than life characters, and shot with the intoxicating lighting skills of Gian Filippo Corticelli. Surely one of the best cinematographers around at the moment. I've heard comments that the film lacks pace and drifts in part, but I personally reject this accusation, rather complimenting the Director for resisting the temptation to ramp up tension with staccato music and chases down dimly lit, foggy streets. The tension is there, if you stick with the development of Giovanna Mezzogiorno's enigmatic character, Adriana. The story twists and turns through the streets and parlours of a Napoli steeped in contrasts, magic and superstition, madness and sense, constantly asking the viewer, but never actually answering: guilty or innocent ? blind or sighted ? gay or straight ? reality or imagination ? What I perceived to have been overcooking it in the performance of Alessandro Borghi, the co-protagonist, is within the regime of the narrative, probabl acceptable; Ferzan Ozpetek measures most things to near perfection, and so it is on this occasion. A feast for the eyes and for the mind. SPRING Milano took root in the Fall Winter of 2017, although the seed was sown by CEO Isabelle Harvie-Watt considerably earlier than that, adding vision and drive to a logical development in the growth of the company already counting impressive businesses in London and New York. Spring was the brainchild of Mark Loy & Simon Powell, who opened the doors to a studio in Spring Place, Kentish Town London, almost 20 years ago. London's most notable photographers have shot campaigns and editorial in the now renowned Studio complex, for clients including Tom Ford, Louis Vuitton, Diesel & Mulberry. As both the Studio business, and a Creative Agency took shape,so too did the ambition, and the logical next development was a structure offering all the same services and advantages, but on a bigger scale. New York, was the objective, and ove the past years the phenomenal Spring Studios building in Tribeca, has entered the scene as a go-to facility for producers of fashion and luxury brand photography, runway shows and events, as well as hosting landmark events such as Robert De Niro's Tribeca Film Festival. 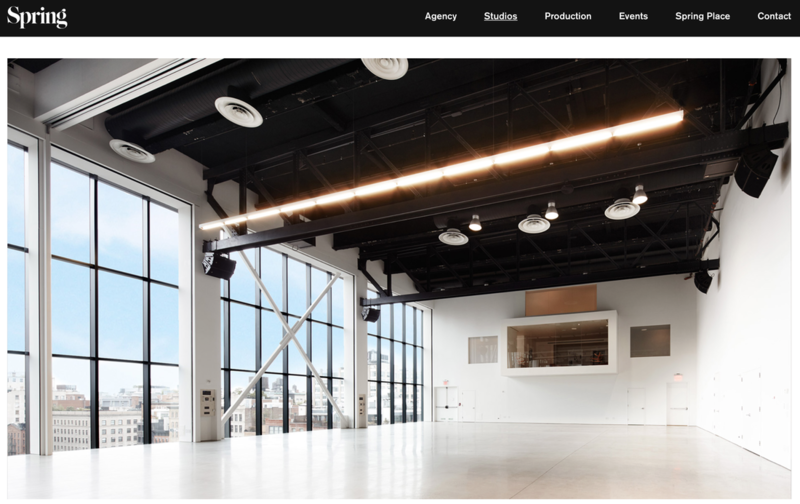 The state of the art Studio occupies a piece of prime real estate on St.John's Lane, just across Canal Street in Manhattan, and offers a stand out alternative to the staples of Pier 59, Milk, Super studio and others in Manhattan. I've had the pleasure of shooting on several occasions at Spring with Bottega Veneta, notably with Art & Commerce video star, Gordon Von Steiner, who squeezed every drop of creative potential out of Spring Studios for Cruise and Early Fall Collection videos. 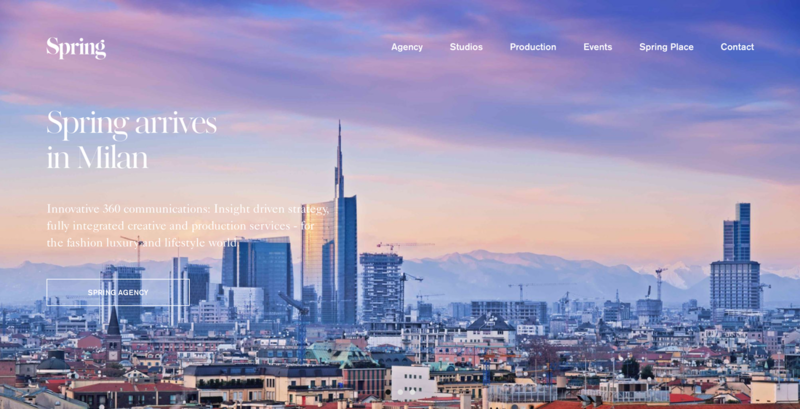 The Milano operation is already flying high on the back of the Creative Agency output, providing tailor made communications packages and Social Media strategies for a number of exacting local clients. Things can only grow, and a the commitment to raising the profile of some extraordinary local talents will underpin the host of project in the pipeline. Milano as a cool and cost effective destination in firmly on the European production map. I generally can't be doing with musicals, so when in the very first scene, a Los Angeles freeway traffic jam bursts into an all-singing all-dancing bonnet-sliding jamboree, I was already squirming in my seat and reaching for the remote control. (Yes rather than wait for the undubbed version to hit the one and only screen in Milan which runs movies in original language, I opted fo the full HD download & beam-to-TV). I held my nerve, and boy was I ever glad that I did. 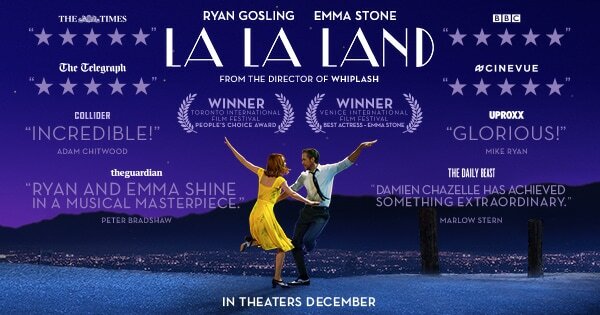 "La La Land" isn't a masterpiece, though on some levels it wants to be, but it's a euphoric ramble of a movie which uplifts, and seduces the audience with it's passion, it's dynamism and the exquisite control. Having been utterly captivated by Director Damien Chazelle's previous outing "Whiplash" I knew in my heart of hearts, that he wouldn't let me down with this movie, and how true that turns out to be. The performances by Ryan Gosling and especially Emma Stone, are spellbinding. I'd not actually noticed her to the same extent before in movies such as "Driver" or "Birdman" (she's done a ton of work btw !) but in "La La Land" her performance is quite magical. Assured and yet fragile, nuances and shades of every emotion imaginable play across her face in ripples and waves. Truly an Oscar winning performance if ever I saw one. Her audition song is all out goose-bump territory. 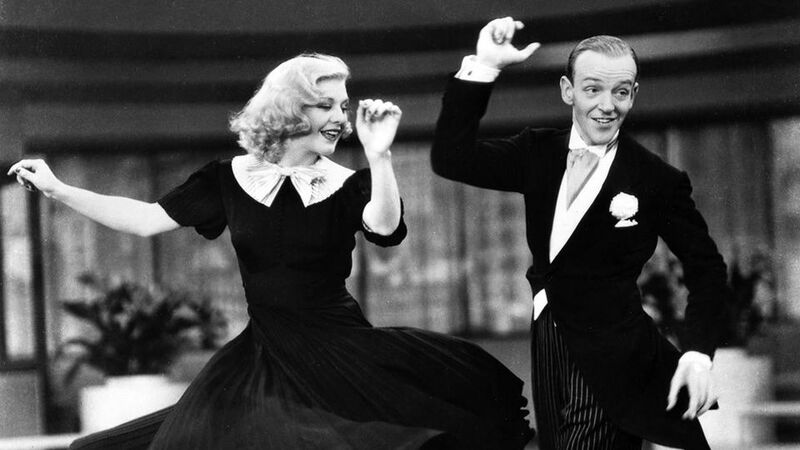 The two leads make a great pairing, whether hitting off each other, or dancing through the many routines which grace the movie, and unashamedly declare the lineage hailing back to the MGM musicals and the likes of Fred Astaire and Ginger Rogers. The music itself extends Chazelle's evident love for jazz, and the storyline pitches the viewer into the despair of Gosling's character who sees jazz as a dying artform. On the evidence of this film, one can only hope that not only jazz, but the musical genre still have not only a place in the hearts of the audience, but a future guaranteed, just so long as there is there are movie makers out there with imagination and craft to keep it all relevant and actual. From many standpoints, this film is yet another perfect example of "Retromodernism" as a cultural and artistic statement in all it's glory. I sincerely hope that the quality, the love and the craft which have gone into this movie, will provide inspiration for millennials and especially Gen Z'ers, who crave the instant fix delivered by social media and the deliberations of so-called "influencers". If I could be blessed with any gift, it would be to be able to influence these people to go see a proper movie, where there outstandingly talented people in every department from set-design, to wardrobe, photography and music, have really come up with the goods. End of sermon! 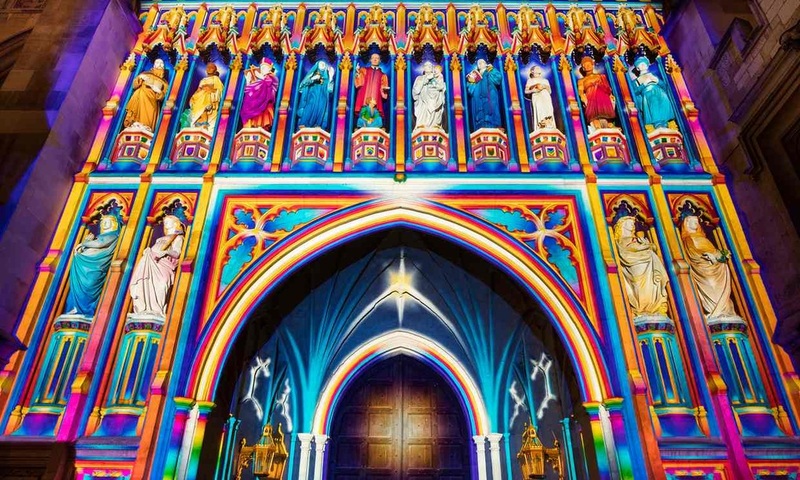 I think this picture pretty much sums up what went through my mind when I read the words "Gucci" and "Westminster Abbey" paired in the same sentence. Surely not... and yet... there is something so inherently contrasting and contrived about he combination, that it actually transcends any kind of value judgement, rather like Dave Grohl in an Abba T-Shirt, or Metallica in Brioni Tuxedos. 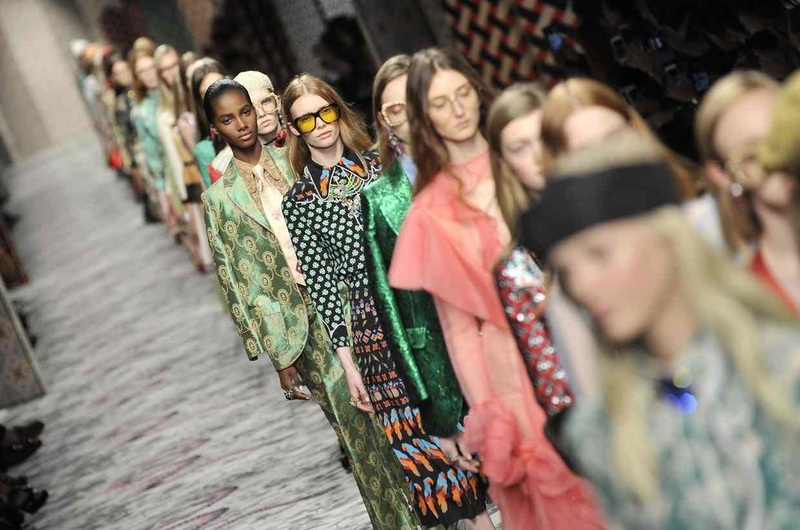 Gucci Creative Director Alessandro Michele, the wunderkind sorcerers apprentice, is, together with visionary CEO Marco Bizarri, turning the business around, by trusting to instinct, flair and throwing caution to the wind. The coup of landing the location, far out-cooling resort shows in Rio by LV, Havana by Chanel or Naples in the case of D&G, is surpassed only by the continuation of bold, brash, till kerchinging collections. Who can deny the logic ? So is "doing it differently", something one would naturally expect from fashion of all industries, likely to become the new normal ? Change oddly enough is represents anathema to the logic and process necessary to keep many Maisons on course, and is firmly restricted to collections, runway shows and the minor variations on a theme performed by the go-to photographers. Without question, pure creativity, like pure fire, has to be contained in a sense, to keep the flame high, without becoming the cause of spontaneous self-combustion. How much is enough, and what is too much? Once again, we come up against the age old balancing trick, of finding the right path between art and commerce. Nick Knight, with his truly unique Showstudio has always been in the vanguard of art media pioneers. Labelled as a photographer, which he is first and foremost, Nick Knight is also a relentless explorer of new creative continents, beyond the drop off feared by fashion's flat-earth brigade. His forays into the unmapped minefields of digital no-man's land, show the courage and the true depth of innovation that will always single to his work as art beyond commerce. 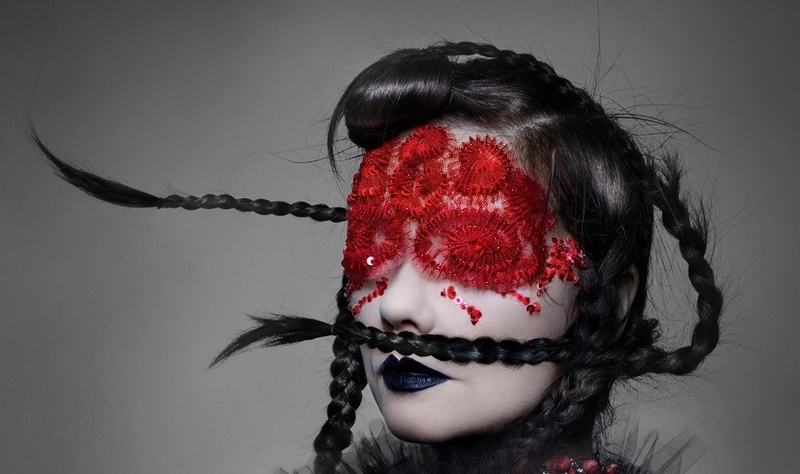 His latest work with the equally ubiquitous Bjork seen below, only serves to confirm the status of both, as unfettered, pure artists. All well and good, but the fashion business cannot thrive on dreams alone, and there is the not so small matter of bottom line to preoccupy CEOs, CFOs and COOs on a daily basis. How is the elixir of eternal profit, prepared by Creative Directors best delivered to the market place in order to nourish the bank balance ? Here we come back to communication; the first budget to be cut when there's a pinch, but the only true means to actually engage with your customers, rather than fussing awkwardly around your Icon wall, and hoping upon hope, to hear the doorman utter "good morning" as he ushers in a customer. And whilst the flourishes evidenced above are outstanding in their ability to draw attention, there is still the matter "engagement", rather that "announcement" to be considered, and here the rule book seems to have gone out of the window. The arrival of Stuart Vevers (curiously enough graduated from the University of Westminster) at Coach, has seen the turnaround of the American leatherwood giant. A fearless creative approach, combined with savvy harnessing of American cultural icons such as Mickey Mouse, and US Baseball franchises, is helping Coach not only to redefine modern luxury, but also to extend the brand's influence worldwide, and most importantly of all, to turn a profit after years in the the doldrums. Thinking outside the proverbial box, is paying huge dividends. As evidence of outside the box thinking goes, it doesn't get much more radical that the recent appointment of Carol Lim and Humberto Leon by Kenzo as joint Creative Directors. Hang on... they are not actually Designers... Well, that's as may be, but the talent they do have in unending supply, is the curiosity, the desire and energy, to never stop seeking touch-points with their customers, and never stop thrilling at the pleasure this bring to those customers. 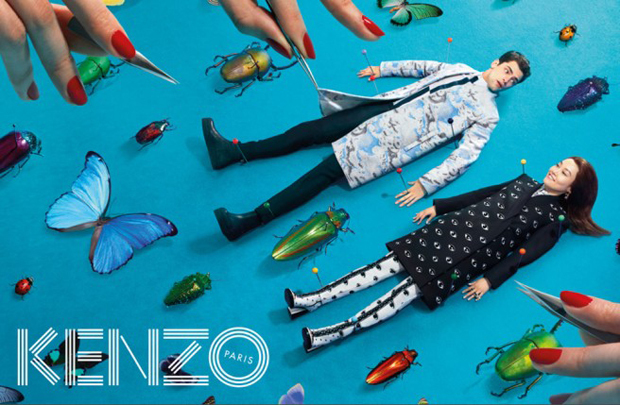 That fun element, is abundantly visible in the emerging Kenzo collections, where they are really shaking it up with campaigns and collaborations with the likes of Vans. 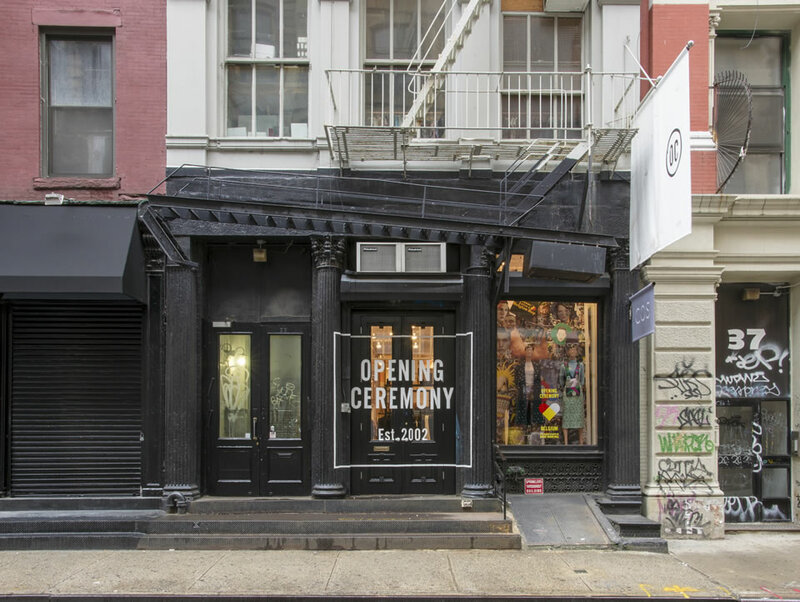 The story of retail success for Lim & Leon, begins with a fairy-tale story of how on a budget of $10,000, they began their own retail operation, Opening Ceremony, a themed boutique where the product on sale would vary from season to season, reflection the pair's passion for travel. Every so often they would feature items discovered and sourced from a new country visited; so it was that they pretty much discovered and loaded up the bandwagon with Havaianas universal best-selling flip-flops. 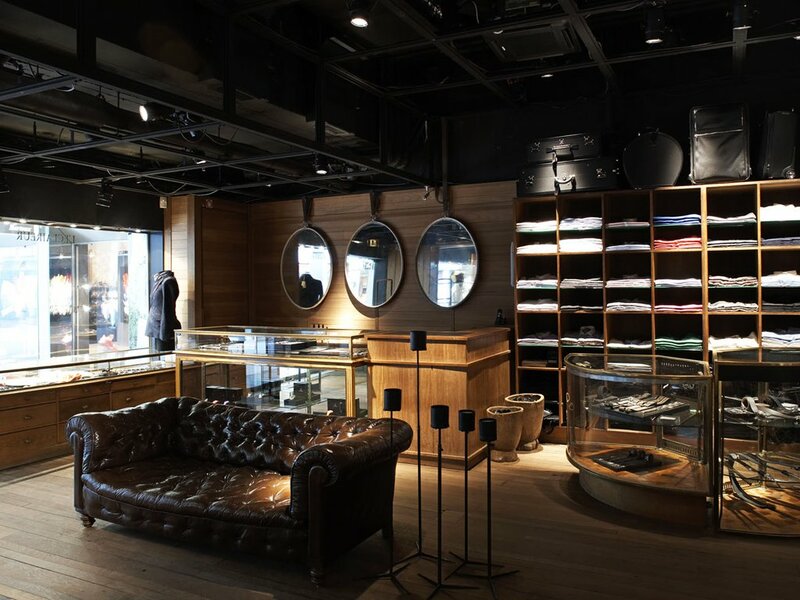 The concept of a retail outlet a place of ever changing style selections, moods and inspirations, as a place of artistic merit, theatre and experience, is of course nothing new. Way back when, Elio Fiorucci set up stores known as the Studio 54 of retail, An Aladdin's cave of ripped and embroidered denims, creating near hysteria among very young and trend conscious Milanese, before branching out around the world with his namesake brand. "An amusement park of novelties" as Fiorucci himself described the experience, which included also items gathered from his travel, kitsch, and Disney characters no less. 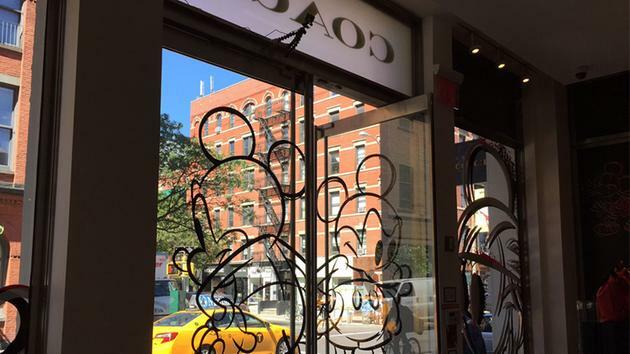 Many enduring brands pull off the store experience extremely well. More sober and focused, but Ralph Lauren is just one example. The master of the art of combining product, ambient, art forms and customer engagement, is Armand Hadida, with his sublimely curated L'Eclaireur. But the space is the space; consumers now track, surf and share their pleasures, depending on the appeal not just of the physical representation of the brand, but it's every manifestation, platform and happening. This diversity of touch-points, and the emotive chemistry which attracts individuals to brands, goes well beyond planting yet another campaign rattled off by a big name photographer, on the pages of vogue. Whilst this format is still relevant to a decreasing circle of uberlux brands, the on-going democratisation of fashion and luxury, together with the means by which we accept or deny their messaging in an insanely overexposed market, is down to personal connection. The connection I believe, reflects a different society, with different values. Those who are getting it right, are easing clear of the pack. Those who remain fossilised with hackneyed stock visual and PR pap, will drop behind the leaders. In this new world, contamination rules the roost, surprising and delighting your customers not just with collections, but with connections, is fundamental, and social media is the outright king (or queen). Among the many artists who are making a name for themselves in this new world, I particularly like the work of Tyrone Lebon, who has craft himself a look which brands are adopting for what it is, an pursuing a line of experimental research and development, answering the call that comes from deep within himself. The results are original, striking, and wholly in tune zeitgeist in to the moment. The rest of this campaign for Calvin Klein, jives to a street-cool mantra, and taps into not just popular cultural aesthetics, but also the outreach of the participants. Kendal Jenner, the model in the polaroid themed ad above, has 90 million followers across Instagram, Twitter, Facebook etc. Who wouldn't want to be #inhercalvins ? What hope for the poor communications professionals in big companies with high ambition, even higher performance targets, but for the most part, dwindling sales figures ? How are they to stem the tide of falling figures, and the resulting cuts to the all important communication's budget ? The answer of course, is that exclusive but elusive magic formula which rarely comes about unless as the fruit of one supremely clear thinking mind, shared and applied by talented people using their own skills and judgement to decline and disperse the message, as best benefitting the Brand. The tools and the instruments available to achieve these aims, are the flora and the fauna of what was once a neatly arranged garden, where TV and Print were the king and queen of the summer ball. We all knew what to wear, how to behave and how to influence those who aspired to be a part of the glamorous life-style portrayed in our ads, and on the pages of our glossy magazines. The arrival of internet, lobbed a grenade plumb into the centre of the front lawn, scattering the digital seeds of wild grasses and fruits, and spawning new hybrid creatures which have since devoured the native white peacocks of that once safe haven. Business communications are now the jungle, where the rules we knew no longer apply. Fast growing creepers will carry a message or a brand-name across the entire landscape in a single season, smothering the boughs and branches of more established brands. Whilst it is important to distinguish Fashion from Luxury in the context of this metaphor, the new nature of digital communication has democratised even the upper echelons price and exclusivity, making the means of communication, as varied and as delicate as the species which inhabit the ecosystem, a fundamental choice in terms of style and sensibility. This has always been the case, but now even more so. What was once a neat rose-bed of options, is now a riot of flour shape and fragrance, and wining the attention of the customer has to be on a one-to-one basis. Our flower must be global, local and appeal directly to the individual. The tools we have to accomplish this, are diverse, smart and engineered to generate hyperbole for KPIs, and affirmation of ROI. I have participated in meetings and heard an excruciating overuse of the term "experience" in relation to the dullest and least compelling messaging imaginable, simply because it is dressed up in tricksy digital bling. But guys and gals....sorry you disappoint you; these offerings are NOT "experiences"; they are hollow and transparent attempts to push product directly into consumers faces, or through their cyber-letterboxes, which may well tick boxes in the course material you studied for your Digi-business MBAs, but sure as hell don't set pulses racing, or "share" buttons sharing. Customer engagement relies on human emotion, and whilst "anger" qualifies, usually just after receiving the n'th e-card in a month, it's not really doing the trick. Emotion ranges from fun, love and generosity, to quirkier and darker areas of the human mind, but it does touch you in one way or another. The best vehicles for these messages, remain without exception, music, film,and photographs, not necessarily featuring a car, a cell-phone, or a life-changing hand-bag. Raw, faithful-to-life, geez-that-could-be-me storylines, sentiments and shared knowledge, will endear you to your desired audience, far more than terabytes of pixelated product animation. I don't mean to beat up on the masters of coding and html, as these tools have a very very significant place in this new communications environment, people are people, not lab rats, and content needs a recipe to nourish, not a formula to feed saccharin addiction. 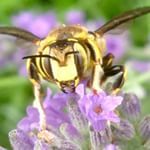 ​One flower - one bee ! Thoughts on business, creative ideas and environmental P&L.